With hundreds of ideas in her head, Darcy is clearly poised on the brink of becoming one of America�s favorite romance writers. She certainly has been trying long enough. Ask anyone who knows and loves her. The long struggle to become published doesn�t take away from her storyteller abilities in the least. Friends, family, critique members and co-workers claim that she keeps them laughing, crying and thoroughly entertained. A native Seattleite, Darcy attributes much of her soon-to-be success to being raised in a nutty household of parents who migrated from the Mid-West and East Coast. That mixture led to much confusion in her young life. Darcy began her writing career while in middle school. She loved the power of words and started with poetry. A bad choice since she couldn�t quite get that rhythm thing down. Her venture into fiction was a young adult story which dealt with aliens stranded on earth. This obviously never got off the ground, especially since America hadn�t even entered the Space Age. Darcy was way ahead of her time. Then she found ROMANCE. In real life, in books and in writing. After more than a decade of writing historicals, she switched to short contemporary and found her voice---flippancy. And that�s where we find her today. Her March 2000 release from Hard Shell Word Factory, is a romantic comedy! 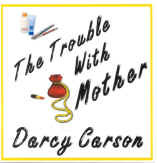 THE TROUBLE WITH MOTHER is . . . she�s dead. Click on the cover to buy the book from Hardshell!